Now a Wall Street Journal Best-Seller! 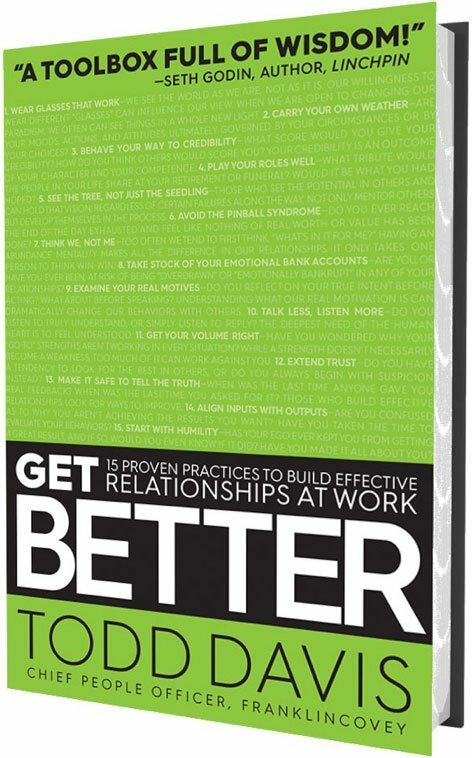 From the performance improvement experts at FranklinCovey—a practical guide to building effective relationships. These 15 proven practices are for anyone, in any organization, that is interested in creating a competitive advantage. A practical guide for anyone looking to create a competitive advantage in any type or size of organization by building effective relationships—from the performance improvement experts at FranklinCovey. 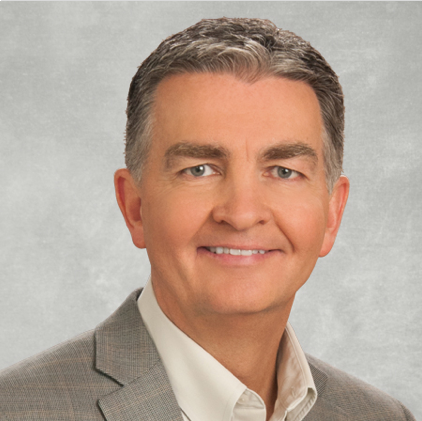 FranklinCovey’s Chief People Officer, Todd Davis, explains that an organization’s greatest asset isn’t only its people; rather, it’s the relationships between its people that is the greatest predictor of personal and professional effectiveness. In the end, employees’ ability to build and sustain great relationships is an organization’s ultimate competitive advantage. Ideal for professionals at all levels of business, government, and education. From the front-line supervisor to the president and CEO, Davis describes the most common relationship pitfalls that negatively affect personal careers and organizational results. Get Better draws on real-world stories in an approachable, engaging style—and Davis’s 30 years of experience in observing, leading, and coaching others brings those relatable experiences to life. He identifies 15 proven practices that influential leaders, as well as individual contributors at any level of an organization, use to take ownership of their work, improve the quality of interactions with others, and master the skills of effective relationships. 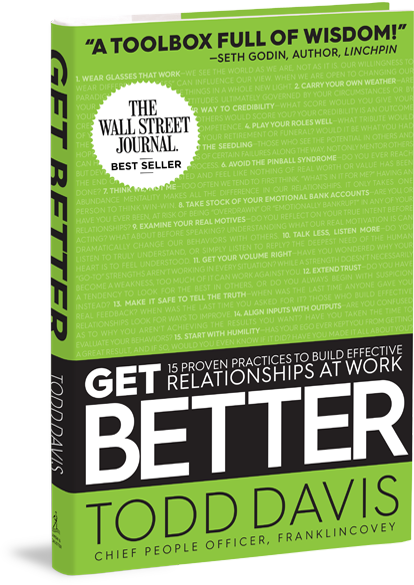 Todd Davis is the author of FranklinCovey’s newest book, Get Better: 15 Proven Practices to Build Effective Relationships at Work, available now. He is also a co-author of Talent Unleashed: 3 Leadership Conversations to Ignite the Unlimited Potential in People. There’s a natural tendency to blame the external world for what happens to and between people. Yet, one of the most important freedoms individuals have is the ability to stop in moments of high emotions and choose, in effect, to carry their own weather. People who learn this practice become proactive instead of reactive when faced with relationship and other challenges. It’s human nature to see things as they are, not as what they can become. Such limiting beliefs, ultimately can become reality. Seeing potential in others isn’t about ignoring the gaps or areas for improvement someone has. Those who see the tree, not just the seedling invest the time and attention to help mentor and empower others to grow into their full potential. The allure of the urgent over the important is a hallmark of modern life. In the rush to move through to-do lists and tasks, relationships often pay the price. But by learning to avoid the pinball syndrome, to step back and account for what really matters, individuals can balance the needs of the moment with the people around them. Those who learn to think we, not me, approach relationships with a wider view. They exchange transitory, short-term wins for long term success. Following this practice can move one from dependence or independence, to interdependence. Choosing to combine one’s talents and capabilities with others can build a larger and more profound win—one that strengthens relationships along the way.